Welcome to Scot Thomas Softball Camps LLC! 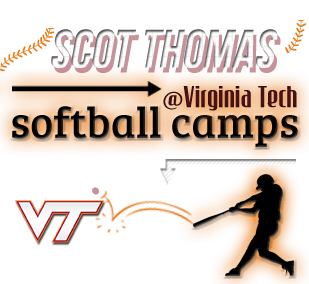 It is the aim of the Scot Thomas Softball Camp LLC at Virginia Tech to provide athletes with the best instruction and atmosphere in which to improve upon softball fundamentals and sharpen skills. Camp includes instruction on fielding, hitting, throwing, base running, pitching, catching, and situational play. Camp is open to any and all participants in the fifth grade through newly graduated seniors.